When we think of oil we think of war and waste; but there is also an oil of peace and plenty. Olive Oil from the fruit of the tree of peace has a deep significance in many religions; it is the oil produced as a staple of many cultures, for many centuries in the Mediterranean and Middle East. 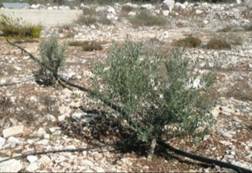 It is the oil that named Christ – the English version of the Greek name for “the anointed one”, anointed by olive oil. It is the holy oil of Islam and the oil of the lamp of Hanukkah for the Judaic religion. 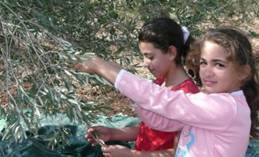 As conflict rages in the Middle East, farmers in Palestine are helping each other by working together in cooperatives to produce olive oil from their trees, the crop of major economic importance in this agricultural land. And it is in a bottle, ready for us to enjoy a little taste of Palestine in our meals. 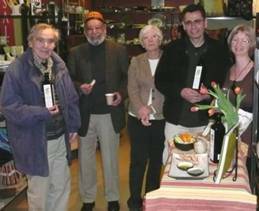 Robert Massoud, a Canadian-Palestinian, founded Palestine Peace Awareness (PPA) Inc., in 2003, a registered non-profit organization in Ontario to market fair trade Palestinian olive oil from these cooperatives under the label ‘Zatoun’, Arabic for olive. Not only is the oil produced in Palestine but it also bottled, labelled and boxed for shipment there, giving maximum benefit to Palestinian workers. The farmers receive a higher price for their oil than from commercial buyers. One dollar from the sale of every bottle is donated to Project Hope, a Canadian registered society that works in Nablus with children and young people in projects that focus on the arts, languages, and human rights. Project Hope has published a fascinating collection of stories by Palestinian students: WEST BANK: A COLLECTION OF GRAPHIC NOVELS. Edited by Rebecca Cox. See: http://www.bbcf.ca/books_1.php for a detailed review. Massoud says that by buying this oil and using it in our homes we not only bring Palestine into our daily lives but that also, “Zatoun helps to create a context based in ordinary everyday life to view and discuss the situation in Palestine-Israel. No longer is it an abstract geopolitical issue involving power elites and undefined national interest.” Zatoun is the essence of Palestine in a bottle. Zatoun is pure olive oil, tested regularly and is straight form Palestine without the generic blending that many commercial oils go through. Apart from the solidarity our purchase of Zatoun expresses, it is superbly smooth and fragrantly flavoured, quite unlike anything found on supermarket shelves. The message is in the bottle – the message is the right of Palestinians to live a decent life, without charity, but with international support to create a viable Palestinian state; with the dignity of a fair exchange and an opportunity for Palestinians to live productively on their ancestral lands. Zatoun, olive oil soap and Za’atar, the Palestinian spice mixture, are retailed across Canada by solidarity, community and church groups, including Ten Thousand Village shops, fair trade outlets operated by the Mennonites. 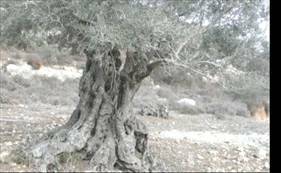 In an article in Peace Magazine (Apr-Jun 2007, page 16) Massoud wrote that, “The olive tree … unites a people with its land and creates the shared experience.” For Palestinians the olive tree is holy and at the same time, part of the family. Trees may be like ancestors, going back to Roman times; they can live for centuries. Young trees may be like siblings or planted as celebrations of the birth of children. Massoud recently visited British Columbia, sponsored in part by BBCF, to meet solidarity workers and to spread the message in the bottle to more people who are looking for positive ways to support Palestinians in their daily struggle. 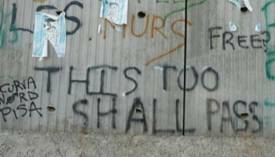 The message in the bottle is hope and peace for Palestine. Massoud welcomes enquiries about Zatoun and welcomes new opportunities to introduce the oil and the message to Canadians.